The Seagate Backup Plus Mac and Windows 4TB Desktop External Hard Drive with 200GB of Cloud Storage & Mobile Device Backup USB 3.0 (STDT4000100) features a simple and one click way to secure or to share your data. It comes with massive storage capacity up to 4 TB. It is compatible for both windows and mac without any need of reformatting. The drive is easy to use and offers 200GB of free OneDrive cloud storage for 2 years. 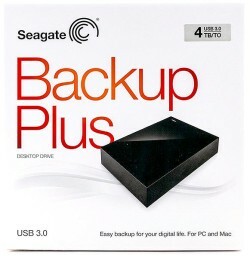 Seagate Backup Plus Desktop is pre-formatted in NTFS for Windows. It also includes the NTFS driver software for Mac. Once installed, this software enables Macs to read and write to the drive. Without this software, Macs generally can just read NTFS file system, but you already know this from our Hard Disk Drive Complete Guide. Note that there’s also Mac version of the Backup Plus Desktop that comes pre-formatted in HFS+ for Macs, which conversely comes with HFS+ driver software for Windows. Essentially, regardless of what version you get, you can use the Backup Plus Desktop with either platform without reformatting. But if you want to reformat, you still can, just as with any other computer drive. Via the Seagate Dashboard software, you are provided with tools for local, mobile, cloud and social media backup. Run a one-click backup or schedule an automatic backup plan to protect your files in your Backup Plus desktop drive at your convenience. Install the free Seagate Mobile Backup app on an iOS or Android mobile device to back up all of the pictures and videos from the device to your external drive or the cloud. Seagate Backup Plus Mac and Windows compatible is a 4 star device that creates easy customizable back up plans with Seagate dashboard software. An extra feature added by Seagate is the cloud storage of 200GB capacity that allows you to upload your favorite files from any computer and mobile device. Some people have complained that it heats up after prolonged use, but this is a common issue with most of these electronic devices, it is advised to place the external drive at some airy place so it doesn’t heat up too much.